Hymenolepsis diminuta is primarily a tapeworm of rodents. Humans are infected following the accidental ingestion of arthropods containing the cysticercoid stage of the parasite. 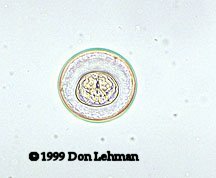 The ova (60 to 70 µm in diameter) are passed in the stool of infected persons. The ova contain a six-hooked oncosphere and no polar filaments. The scolex of H. diminuta has four suckers and a rostellum without hooks. The rostellum is not visible in this image.